It’s an art we have spent decades perfecting. The success of each safari is dependent on understanding and consistently surpassing your needs and expectations. Today’s safari must be an experience that is true to the great safaris of the past and draw on over a hundred years of exploring Africa. It must be a multi-dimensional journey through some of the least-changed parts of this magical continent, able to sharpen perspective and enrich one’s life. 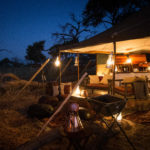 A Royal African safari will always be managed and led by a Royal African Partner — with us, you travel with an Owner of the business and gain access to our unique team of specialists. Our safaris are only sold from guest to guest – 100% word-of-mouth, and more than 60% of our guests return, often over several generations. We bring over 100 years of experience and a deep love of Africa to each safari, factors which combine to ensure your safari is, as Shakespeare said, “such stuff as dreams are made on”. Personal touches unique to your experience.